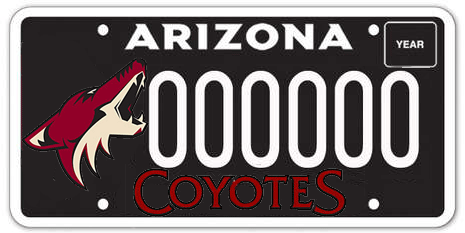 On the face of it, you’d think the sole people to point fingers at for voting down the Coyotes special license plate (and others) in the same bill are the Arizona State Senators that switched their votes from “yes” to “no”. They do bear some of the blame, but maybe not most of the blame. The SB1480 bill the Senate voted down had no resemblance to the SB1480 bill they approved in March. The language was gutted and replaced by the House. It was politics as usual; obstructive, obstinate, counterproductive, expensive. Senate President Pro Tempore Senator Gail Griffin (District 14, Southeast AZ to NM border) has her name on the bill related to the process for (I think) a school board to petition to become a “transporting school district”. Click here for the text of the original SB1480. Click here if you want the page with access to a bunch of information about the history of the bill. Senator Griffin, by the way, was a driving force behind three recent measures aimed at the endangered Mexican gray wolf. One was a Senate resolution (SCR1006) intended to move management of the wolf as an endangered species from federal to state control and to shift reintroduction efforts to the mountains of… Mexico. Yes, to another country. Because of their name? Senator Griffin then introduced an amendment to SB1480. The amendment (click here) is aimed squarely at Greenlee county, the only Arizona county with a population “of less than 15,000 persons.” My take is that it’s meant to prevent the school district from adopting a budget that exceeds the cost of transporting all of it’s school children to another school district if that’s what they’re doing via becoming a “transporting school district”. That amendment was in place (click here) when the “third reading” vote passed the bill to the House on March 20. If you look at the March 19 agenda (click here) for the House Transportation Committee, you’ll see that SB1480 is there with a “Strike Everything Title”. So, the Transportation Committee planned to remove all of the existing bill text passed by the Senate on March 20 and replace it with something to match the new title “Special License Plates”. They did so, and moved the revised bill (click here) on to the Rules Committee. Only four of the committee bothered to show up, Escamilla and Gray had things to do other than to show up and vote. The four that showed up voted “yes” on March 20. Michelle Ugenti (District 23, R, 602-926-4480) then added the “Fallen Heroes” special plate to the existing mix of plates. The Rules Committee then approved SB1480 unanimously (save for one absent member) on April 2, moving it on to the entire House. House then passed SB1480, with JUST the special license plates language, with a 42-18 vote on April 15, thus sending it back to the Senate for final approval. Click here for the final language. When the Senate got around to voting on the SB1480 “license plate” bill on April 23, they decided to shoot it down. Click here for a clearer definition of that vote. We’ve gotten mixed messages from Senators contacted by people we know regarding why they changed their vote. It wasn’t obvious that the SB1480 rejected by the Senate had no resemblance to the bill they sent to the House unless one was willing to do some time consuming research. While it seems the Senators involved also clearly have license plate blood on their hands, it seems the culprits are the Transportation Committee members that gutted the original bill. It looks like that’s the way it works downtown Phoenix. I honestly don’t know, yet, what the standard procedure is for the people that have their hands on the throttle of the Arizona train. It sure doesn’t make sense to me. I had a brief conversation with Senator Ward, one of the dissenting Senators, on Twitter. Senator Ward didn’t mention the gutting of the original bill as being a problem. If what the Senator says holds true for enough other Senators, perhaps the special Coyotes license plate should somehow ride in on another bill all by itself to succeed. We will get closer to understanding the sequence of events and the people involved before the license plate thing comes around again. Will keeping an eye on the process be enough? Maybe not, you can see the process is not linear and things happen for reasons we won’t know. However, it clearly pays to contact your legislators and offer them your opinion on anything that is important to you. Votes, and the voters that cast them, count in political maneuvers. It might be frustrating and annoying, but “regular people” certainly have the capability of influencing the matters of government. All it takes is vigilance and patience.